Davenport Air Conditioning, Pool Heat or Electrical problem? Kalos Services - 352.243.7099Davenport Air Conditioning, Pool Heat or Electrical problem? a Guest is threatening to leave because there’s no Air Conditioning. No matter when someone in Davenport calls Kalos they will always get a live person on the phone and get their need scheduled. Employing NATE certified technicians across the Pool Heat, Electrical and AC fields. our experts will arrive quickly and handle you problem as efficiently as possible. 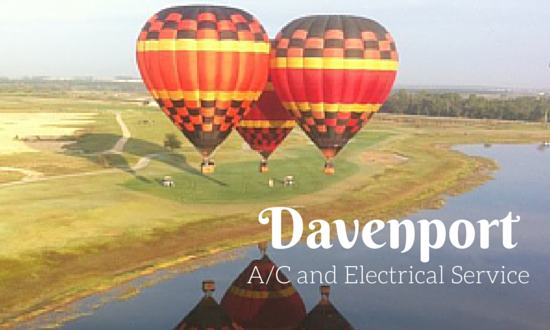 Since we opened in 2005, we’ve become one of the most respected Davenport air conditioning repair companies. We began most of our work in the Davenport area by working with property management companies in the short term vacation rental houses that are scattered throughout the city. Many of the most respected Davenport property management companies use Kalos Services, Inc. for all of their A/C, Electrical and Pool Heater needs. We know what it takes to serve the property management industry and we understand how vital well working facilities are to guest satisfaction. Davenport is a great city with interesting challenges and we’re honored to have the chance to meet those challenges. We’re proud members of the Central Florida Vacation Rental Manager’s Association and we hope to earn and continue to keep your business through our customer service, honest answers and the quality of our work.